Anyone know what’s going on at Muckley Corner? 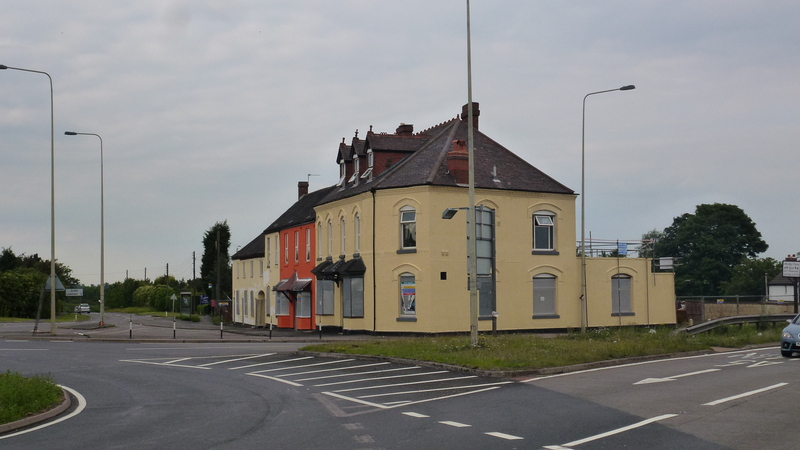 The Muckley Corner – latterly re-christened the Old Corner House Hotel when new owners tried to take it upmarket – after standing idle for nearly two years now seems to be in the process of regeneration. 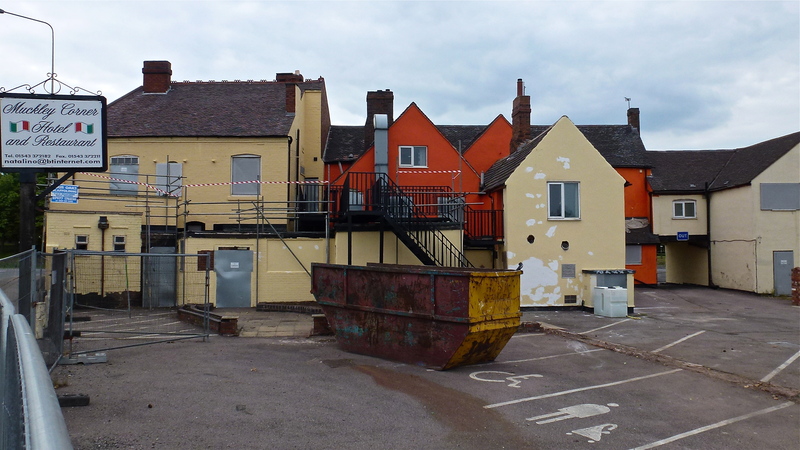 No planning permission has been sought for anything, and the whole building is being repainted, some of it in a strident, vivid orange. The upstairs windows appear to have been replaced and curtains now hang there. Anyone got any info? This is a huge site really, and I’d love to know what the new owners are planning for it. I do hope it reopens as a pub of some kind. Thanks to all the folk on twatter who tipped me off about this, much appreciated. If you know what’s in the pipeline, please do comment on this post. Not at all sure about that orange. But the building does look nicer. 6:12pm, Sunday, 3rd July 2011. Lots of work has been done, clearly, but there must be much still to do. 6:14pm, Sunday, 3rd July 2011. It's nice to see the once-derelict building smartened up. 6:16pm, Sunday, 3rd July 2011. 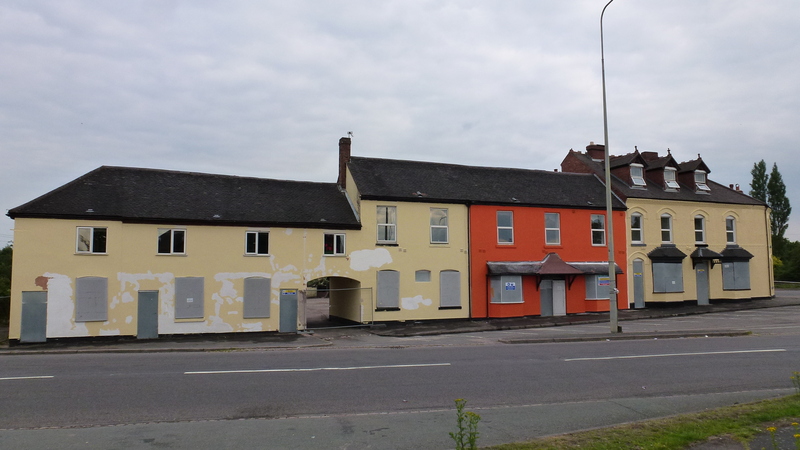 This entry was posted in Brownhills stuff, cycling, Environment, Followups, Interesting photos, News, Panoramio photo discussions, Panoramio updates, planning, Reader enquiries, Shared media, Social Media, Walsall community and tagged Brownhills, Derelict, Lost pubs, Muckley Corner, New Photos, Orange, Panoramio, planning, Pubs, re opening, Redevelopment, Staffordshire, The Old Corner House, Twitter. Bookmark the permalink. 8 Responses to Anyone know what’s going on at Muckley Corner? new barracks for Cromwell’s army? Travelling back from skegness on saturday we noticed the renovations being carried out here and remarked that the bright orange/ cream colours, and the way they were painted in blocks, were the same as another pub/hotel we’d passed earlier that also looked newly renovated, so don’t know if it’s part of a chain of pubs/hotels, or just a coincidence. Hope it does reopen…….it was sad to see it standing idle. Many years ago, the hotel was just the end part on the corner [painted black and white] and the rest were a row of terrace houses. My Aunt and Uncle lived in the one painted cream, to the right of the arch [first picture] from the 60’s-80’s, and the lady that owned it [Mrs Carter] lived in one of the others, possibly the one painted orange. If we needed the toilet, which was in a brick hut in Mrs Carters garden, we had to shout over her fence and wait for her to take her alsation dog in before we could go……very embarrassing. The stairs in my aunts house were the narrowest I’ve ever seen, I was just a child with tiny feet at the time but I had to literally walk up sideways, and my Aunty always followed behind in case I fell back down .I remember my aunts garden was part of what looked like a row of allotments at the end of the row [to the left of the first picture]. I shall be watching with interest. I don’t have a clue what is happening other than the colour scheme might suggest they think it is a certain little Scottish town called Balamory. Seriously anything that brings a disused building back into us must be a good thing, especially a building of this size – wonder if the people who own this could do something with the Mellish Road Methodist Church in Walsall? The JCB was moving into Mellish Road Methodist Church at just after 7am this morning…I wouldn’t hold out much hope. ‘Change of use existing hotel (part) into 4 residential units; access and associated works; extension of Unit 5; alteration and extension of existing garage’. Applcation has been gpermitted and was received 1st September 2011. The reference nunmer is 11/01005/COU if you want to check it out. My great grandmother lived in the rooms to the left of the arch 60s thru 80s. My Uncle Ned occupied the room immediately to the left of the arch, and gran lived to the left of that. I’ve used the bathroom you refer to here. It was one of those pull types…you pull a chain from above. i worked here in about 2007 under the Italian restaraunt manangment, it is being turned into houses. sad really.